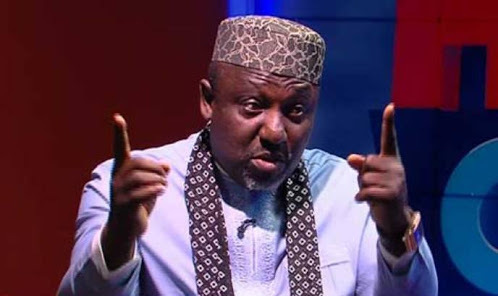 Imo State Governor, Rochas Okorocha has called for the arrest and prosecution of Ahmed Gulak over his “ignoble” role in the APC governorship that led to the cancellation of the exercise. Gulak was the Chairman of the APC Governorship Primary Election Committee for Imo State and had declared one of the governorship aspirants, Senator Hope Uzodinma as winner. The Imo Governor in a statement signed by his Chief Press Secretary, Mr. Sam Onwuemeodo, said, “We call for the arrest and prosecution of Alhaji Gulak because there is punishment for his anti-democratic action and his false claim of kidnap attempt. We must begin to tell men like Gulak and Senator Hope Uzodinma that it cannot be business as usual”. According to the statement, “Alhaji Ahmed Gulak, former Political Adviser to former President Goodluck Jonathan and of course, the Chairman of the disbanded Imo State Governorship Primary Election Committee had told the media on Tuesday, October 2, 2018 that he fled Owerri by 4am because agents of Governor Rochas Okorocha had attempted to kidnap him and three other members of the 12-member Committee. The media had reported what he told them. “If you ask me, men like Alhaji Gulak can’t build a nation. They not only constitute serious threat to our promising democracy but also danger to this great nation. Giving men like him national assignment like the one he was sent to Imo State to do was just licensing him to blackmail the nation and put our democracy to ridicule. And there are certain lies or actions a man who had been the Political Adviser to a former President of the nation should have overgrown, no matter the temptation." The statement added that, “the childish tale of his attempted kidnap was just an afterthought. He knew he didn’t act well his part and was only trying to see how he could come out from the tight corner he had boxed himself into. “The man called Alhaji Ahmed Gulak flew into Owerri by 12:45pm on Monday, October 1, 2018, being the day slated for the guber primary. And let him publish his flight documents to prove us right or wrong. They went straight to the Police Headquarters where they deposited all the materials for the governorship primary. “After that, the committee members entered into a lengthy meeting with the candidates, stakeholders, and Heads of Security Agencies in the State. The meeting lingered till 6:30pm. At the end of the meeting, he announced that the primary would now hold on Tuesday, October 2, 2018. "And reporters who were at the Police Headquarters waiting for the outcome of the meeting went and reported that the Imo primary would now hold on Tuesday, October 2, 2018. At the end, they went to their hotel to clean up and eat. “With all these activities, the courtesy call he was to pay on the governor with members of his committee could not take place till. 8:45pm that Monday. The courtesy call lasted for about an hour. All said and done, they left the Government House for their hotel at about 9:55pm. “They lodged at Rockview Hotel Owerri that shares fence with the Police Headquarters and the other end of the hotel, the Owerri Prison, with Soldiers on guard. The hotel is also close to the Government House Owerri with a team of Mobile Policemen on twenty-four hours duty. "So, the question patriotic Nigerians should ask Alhaji Gulak is that, if you left Government House by 9:55pm and you claimed you fled Owerri by 4am, and considering the location of Rockview Hotel where they lodged, then, when and where did the kidnap attempt take place? “And why should he be kidnapped when the materials for the primary were kept at Police Headquarters. And of what value would have his kidnap served anybody since he didn’t have any material and the primary hadn’t been conducted. “It is now left for Nigerians to ask him where he got the results for which he declared Senator Hope Uzodinma winner. "In fact, we do not subscribe to people talking about PDP when men like Gulak who left the party just few months ago act funny. It is a personal thing. It has nothing to do with PDP. Some people live. Some others exist. Those who just exist do not have souls, and for them, anything goes”. The Governor explained further that, “Ahmed Gulak and Hope Uzodinma had belonged to Alhaji Modu Sheriff’s faction of the PDP. That is the relationship between him and Hope Uzodinma. We also believe that those who sent him didn’t have this information. But even at that, a former Political Adviser to a Former President should have lived above board. “Do not also forget that a day before the Primary, Chief Hope Uzodinma who the Court had issued warrant of arrest against him for issuing billions of naira Dud cheque to a business partner had also claimed kidnap attempt against his person also by agents of the State Governor. They must be spirits to be escaping from these imaginary kidnap attempts. In fact, show me your friend, and I tell you who you are. “Finally, Hope Uzodinma is not a member APC in Imo State. He claimed to have joined the party six months ago. Even at that, he does not have any support in any Local Government in Imo State. We shall be shocked to see him stand in his Local Government, Oru East, and we see twenty APC members queuing behind him. He does not believe in the ballot box. “He was one of those who in 2015 labeled Okorocha Alhaji in Government House, Okoro-Hausa and that he was planning with President Muhammadu Buhari to Islamize Igboland, all because of APC. “And few years after, he has come to cause trouble in the Party and to reap where he didn’t sow. We do not think it is the right thing. No landlord vacates his house for an unfaithful and unreliable tenant”.